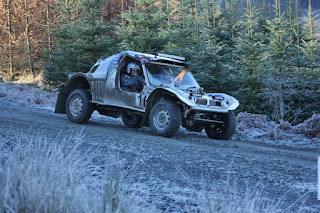 Full entry list for this weekend's Borders Hill Rally at the Forrest Estate, Dumfries & Galloway DG7 3XS (77/NX564861) and some basic spectator info. There are two Legs with 16 Special Stages totalling some 93 miles of competitive action. Leg One is on Saturday 18th and the shorter Leg 2 on Sunday 19th, but Saturday's Leg includes 3 stages in the dark finishing around 7 or 8 in the evening. The first Leg starts at 10.00 am on Saturday morning and the second Leg at 10.00 am on Sunday morning with the first car finishing around 1.30 in the afternoon. If you're doing nowt else this weekend and looking for an excuse to escape washing the car or the dishes, it's well worth a look and a listen - V8s, V6s and straight sixes plus a whole host more 4 cylinder jobs. Even the diesels sound good.